Lewes is the County Town of Sussex. It has a long, colourful history, dating back through many centuries, and including burnings, murders, ghosts, plagues, and an avalanche. Even Jack the Ripper has connections here! I met Robert the Ghost Walker outside the Town Hall. It was a cold, clear night, ideal for a slow walk up and down the hilly Lewes lanes. Robert really looked the part; he wore a trilby over his ponytail, and carried a lantern and a walking-stick with a skull on the top. But as Lewes is quite an arty, eccentric town, nobody took any notice of him! A few yards down the road from the Town Hall is the Martyrs’ Memorial in the middle of the road. Strangers to the town often think wrongly that it’s something to do with the war. They couldn’t be more mistaken. It marks the spot where Protestants were burnt to death when Catholic Mary was Queen. Most of them were imprisoned in the Town Hall, awaiting their gruesome fate. A good executioner could show mercy and strangle the victim before they were burnt, or he could make a burning last two hours to entertain the crowd. Every Bonfire Night, the 5th November, 17 burning crosses are carried through the town to commemorate the 17 Martyrs who were burnt to death. We walked up the hill and along Fisher Street to the Lamb Inn. My parents met here. My Dad was in the Commandos and posted to Lewes. My Mum was only 17, and shouldn’t have been in the pub! She told my Dad that she was older. Many years ago, Lewes had seven churches, and nine breweries. 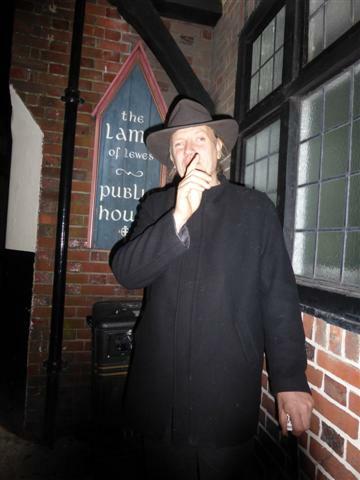 A ghost floats up the cellar steps in the Lamb. It is said that he’s either a soldier who deserted, or a French refugee. He was either hacked to death, or he loved living there, and died a happy man. Two very different stories, I’m sure you’ll agree, Dear Readers! the storeroom on the 3rd floor, and he has been seen clearly several times, or his presence has been felt. In his 40s or 50s, he’s dressed in a uniform from the 1950s, with three stripes on his epaulettes, which shows that he was a Chief Inspector. Lewes Police Station was the only police station in the country where the police felt safer outside in the early hours! Down the road and turn right, and you can see St John Sub Castro in front of you. It was outside the Lewes town walls. 53 Finnish prisoners are buried in its grounds. They were prisoners from the Crimean War and they died in the old Lewes Prison. Their graves were looked after by the Russian Embassy. In the church is a monument to Magnus, who was an anchorite; a hermit. He was bricked up in the church walls, with just a small gap for food to be passed to him. He’s still there in the walls somewhere. Back at the end of the road is the Elephant and Castle. A man has been seen walking through a wall and out the other side. The area’s known as Gallows Bank, because it was where public executions took place. Oh, they’re never been short of entertainment in Lewes! Most criminals are unrecorded. But the most famous is Sara French who poisoned her husband by lacing an onion pie with arsenic. She told the chemist that she wanted the arsenic to get rid of mice. She was hanged in 1854. Up the steep Castle Banks, near a house that was owned by Virginia Woolf, we walked along to Lewes Castle. Before we got there, on the left is a field which used to be where the Medieval joustings took place, when the castle and the surrounding area were occupied. A monk has been spotted, strolling along the perimeter, his rope belt swinging to and fro. Then he disappears. Back on the High Street, we turned right and walked up to St Michael’s Church in the Bottleneck, where the road narrows. Lewes used to be a port, although it’s been silted up for centuries. Ships used to moor and unload in Landport. The first passengers to leave the ships were the black rats, and it was them who brought the Bubonic Plague to Lewes in the 1600s. The plague victims are buried in the churchyard. So are the smallpox victims from the 1700s. Lewes was one of the first towns to be vaccinated. And it seems to have worked! Typhoid was the next disease, at the end of the 19th Century. It was so rife that Bonfire Night was cancelled! In the early 1920s it was influenza, probably brought to Lewes after World War l from Europe and the Far East. Just across the road is the 15th Century Bookshop. The ghost in there is so solid and real that he’s been asked about books! We walked slowly down the steep, cobbled Keere Street. Apparently the Prince Regent galloped a coach and four horses down it for a bet. At the bottom, across the road, is the Grange. It was built of stones pilfered from the Priory that was destroyed by Henry Vlll, and a monk has been seen in the gardens. He was seen during the Lewes Floods, walking casually through the water! In Southover High Street is Anne of Cleves House. She was given a table as part of her dowry when she married Henry Vlll. When the knights murdered Thomas a Beckett, they threw their bloody swords and armour on the table and the table rocked around and threw it off! Charlie Watts of the Rolling Stones used to own a house further along the road. In the other direction, past the station, we turned right into Friars’ Walk. Yes, there are a lot of connections with monks and friars in Lewes, because of the old Priory. All Saints Church, now a Community Centre, has several ghosts in the graveyard. And further along is where the Medieval Faeries would gather. People used to throw a piece of iron, which was usually a pin, down a well, known as Pinwell, for good luck. Up another steep lane, we came out just below the Martyrs’ Memorial. W.E Baxter’s printing works was there for years, even after a terrible fire in the 1960s. Baxter had three sons in the 1800s. Wynne Edwin Baxter had no interest in the printing trade. Instead, he became a Coroner, and examined three of Jack the Ripper’s victims. He also examined Joseph Merrick, theElephant Man. We barely touched on the things that have happened in Lewes. That was just a short leisurely walk, taking 1½ hours. It was getting colder as we said our goodbyes outside the Town Hall again. And I must admit that I did feel a bit nervous as I walked along the deserted, echoing street, back to my car! My Books include Ghostly Tales and Hauntings of East Sussex, Ghostly Tales and Hauntings of West Sussex, Ghostly Tales and Hauntings of Northamptonshire and Local Ghosts -Ghosts of Eastbourne, Seaford and Surrounding Villages. All of these are now avaliable on Kindle. Actual physical copies have mostly sold out now !! Work published in numerous National Papers and magazines. Weekly Column in Eastbourne Herald. Various BBC Local Radio and BBC South Today TV, Meridian TV, Countryfile and many more. Also published several books on Astronomy and also taught this subject for Warwick University at one time.